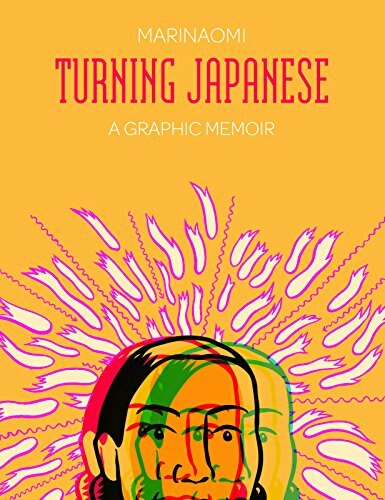 This is the third graphic memoir by MariNaomi, the author of the award-winning graphic memoir Kiss & Tell: A Romantic Resume, Ages 0 to 22 (Harper Perennial 2011). Turning Japanese begins in 1995 when MariNaomi is 22 years old and chronicles her attempts to recover from a break-up with Francis by moving from San Francisco to San José and meeting Sicilian cab driver, Giuseppe, who is a passive companion on her picaresque journey. Mari is a “hafu” with an American father and Japanese mother who hopes that working as a hostess in a Japanese bar will improve her minimal Japanese and help her to connect with her mother’s culture. The “girl talk” and customer management in the bar is wittily and economically conveyed. But while she learned many things in the bar, the experience improved neither her language skills nor her knowledge of Japan. To rectify this, through one of her fellow hostesses she plans to take a three-month job in a hostess club in Tokyo’s Ginza district. The bar wants a blonde girl so MariNaomi makes sure that is what they get. The graphic novel is a perfect format for illustrating her transformation. Her time in the bar—steaming towels, preparing hot snacks, coping with groping, meeting family, and getting to know Tokyo with Giuseppe passively in tow are perfectly conveyed in MariNaomi’s simple visuals and deadpan narrative. Turning Japanese shows that a picture can indeed be worth a thousand words, and is the perfect form for these rather quirky but un-dramatic adventures and its eccentric cast of characters. MariNaomi does not disappoint her many fans.